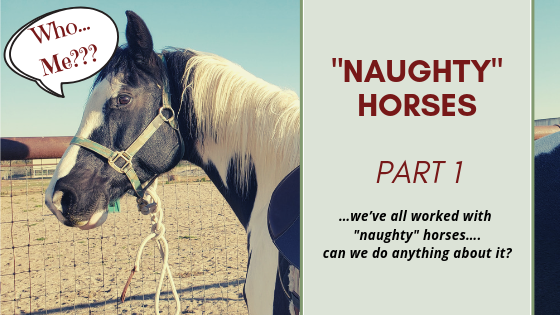 …we’ve all worked with “naughty” horses in our lessons….can we do anything about it? This was a topic voted on by the followers of the Hoof Falls & Footfalls Facebook page and pairs with the December 2018 Instructor Chat video that you can view HERE. We’ve all had horses behave ‘bad’ in our lessons…..
You know…those naughty horses that are pinning ears, nipping, pulling riders to center of the arena or to the gate….and the list goes on….. Whether they were being ‘bad’ for us as we are taking that lesson or they were being ‘bad’ for our students or volunteers while we were teaching they are doing something other than what we humans see as ‘good’. So what makes good horses go bad in a lesson and can we do anything about it? I’ve spent a lifetime with horses in various situations and, at the time of writing this, have been fully immersed in Equine Assisted Activities and Therapies (EAAT) for a decade. I currently teach adaptive riding, adaptive horsemanship, and equine assisted learning lessons (along with traditional able-bodied programs) but have also overseen various therapies that incorporate equines (PT, OT, speech, mental health). And I will be honest that I have seen some very good and some very bad horses in both the traditional equine activities and the many programs and services offered in the EAAT realms. I’ve personally had horses behave “bad” in the lessons that I am teaching, seen horses be ‘bad’ in lessons of instructor’s that I’m mentoring, or even my horse be ‘bad’ during a lesson that I’m taking! But why do our horses act “bad”? Are they just not wanting to cooperate that day? Do they have it out for me for some reason? Or…is there something more to them acting “bad”? Us humans have a habit of blaming the horse too quickly for acting or doing things WE consider ‘bad’. I’ts human nature to try and blame others for things…whether that ‘other’ is another human, an animal, a situation, etc. If we are not careful of how easily the blame game can start, and the consequences it can have, we will soon find it everywhere in our lessons and impacting our horses. And before someone thinks I’m sitting here on my high horse (yes…pun intended) and implying that everyone but me blames the animal, I will be the first to admit that I am guilty of playing the blame game while training, taking lessons, and giving lessons. I have made a conscious effort for a while to not fall into blaming the horse but those ‘blames’ can slip out easily sometimes (just like blaming another person for how I choose to act in a situation). It’s so easy to let the verbal blame flow and say something like “this horse is just being bad today”, “she is just acting like a mare”, “he is just being a [insert explicit word], so kick harder and make him go”. A lot of times we take the easy way out and blame the horse when, most often, they are being ‘bad’ due to operator error (aka the human) or some other external factor (again…usually stemming from the human) that has led to the horse thinking that that ‘bad’ behavior is appropriate for that situation. A horse thinking that they can act poorly in a situation could stem from the horse learning that that behavior is acceptable or it could be due to the horse behaving a certain way because it is trying to communicate pain and discomfort. Horses are a living, breathing, sentient animal….and this animal has it’s own brain and unique way they process the world and we, as instructors and horsemen need to be aware of this. WE need to be observant of what we are doing, or the situation we are putting the horse in, that can cause these ‘bad’ behaviors to appear. So, step one in figuring out why our horse is acting ‘bad’ is to stop blaming the horse and start looking at the big picture. Look at all of the factors that impact your horse on a daily basis and see if you can narrow down the root cause(es) of the behavior(s). 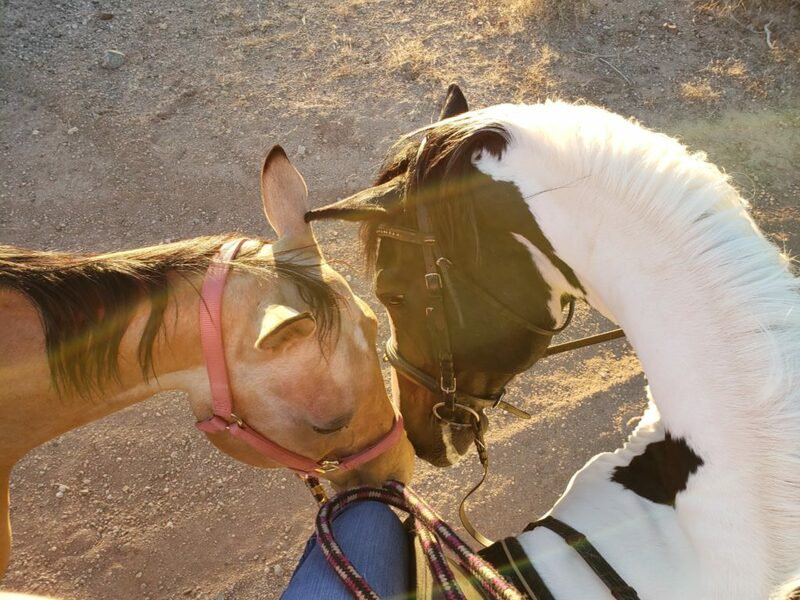 Often times our horses are “talking” to us and trying to communicate things but they are repetitively ignored or not “heard” for various reasons. Perhaps the person working with the horse is uneducated in equine behavior, body language, and psychology. Perhaps the person thinks they have a good understanding of horses but in reality they inaccurately read the horse or do not correctly associate cause and effect. Perhaps the person is well versed in reading the horse but just chooses to ignore what the horse is saying, for whatever reason. The horse first tries to communicate with us through little “whispers” of body language and they often go ignored. The crinkle of the mouth, size of the eye, posture of the body is not heard. These whispers work when communicating with other horses and is the daily dialogue that is ingrained into their being…why is this human not listening? The “whispers” from the horse are ignored so they then try to “talk” louder though pinned ears, tail swishing, stalling out, gnawing of the mouth. These louder talks are usually reserved for less frequent occasions and the receiving party usually listens right away…why is this human not listening? The “talking” is ignored so then the horse starts “shouting” through nipping, raising a leg, crow hops, head shaking. This way of communicating is even less common and is usually for very naughty foals or youngsters learning their place, self-protection, or expressing pain…why is this human STILL not listening? Then even the “shouting” is ignored and a “scream” or blowup happens through a rear, a buck, a full on bite, a kick. The humans are often shocked at this extreme reaction…but the warning signs were there…. I am in no way trying to anthropomorphize a horse through the examples above. Rather, I am trying to encourage people to do the opposite- to encourage people to see the horse as a horse. To read listen and read what the horse is ‘saying’ through the lenses of understanding horse psychology and herd behavior instead of trying to put my own human take on everything a horse does. A horse is a horse. A human is a human. When working with horses we need to think and communicate like our equine coworkers …not force them how to communicate like us. Learn to listen to your horse when he whispers and accurately interpret what is being communicated– Take lessons from quality horsemen. Read books on equine behavior. Watch videos on herd dynamics. LEARN about your equine partner…and never stop looking to learn! Learning to listen and read your horse is like learning a second language. It takes practice, time, and effort. Be consistent in what you are asking of your horse– Horses thrive off consistency. They don’t differentiate between situations, people, locations and they way they act. They can’t be expected differentiate between when they are/are not supposed to act a certain way depending on who is working with them, where they are, what lesson they are in, etc. They need consistency of what is asked and expected of them no matter who/what the circumstances involve. Does everyone (you, other instructors, students, volunteers) handle the horse in the same way? Do you all expect the same ‘good’ behaviors from the horse or do some people allow ‘bad’ behaviors for various reasons? Example 1 of inconsistent expectations: 90% of the time it’s not ok to pull towards food…but then 10% of the time it’s ok to pull towards food because that behavior is what we really need for an Equine Assisted Learning class to demonstrate ‘x’ behavior to the student. Example 2 of inconsistent expectations: 90% of the time the horse is expected to not come into the middle of the arena and stop by the instructor….but then 10% of the time, when class is done, they can come in and stop. 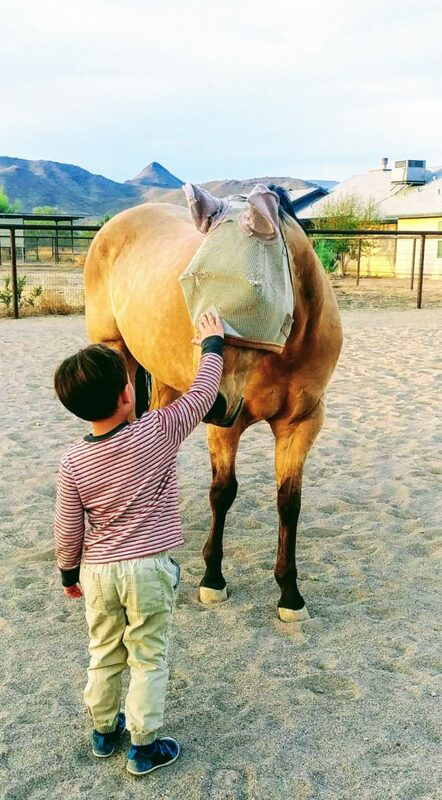 Example 3 of inconsistent expectations: 90% of the time we expect the horse not to be mouthy, to not nibble, not grab clothing, not grab fingers at the ramp….but 10% of the time the instructor/student/volunteer stands there and pokes, prods, and plays with the horses lips until they get a reaction. Example 4 of inconsistent expectations: 90% of the time the horse is expected to not react to any thing ‘scary’ during a riding lesson (something flapping, loud noise, people jogging by them)…but 10% of the time the horse needs to ‘react’ (aka: spook) to something ‘scary’ so that we can see an (overly) obvious behavior for a specific learning reason. Show your horse that you are willing to listen to the “whispers” and they don’t need to talk loud or shout anymore– This takes time and consistency. You, and every other person working with the horse, need to consistently listen to what the horse is saying and respond in a timely and appropriate way. If you consistently listen to your horse the first time he tries to communicate something, you try to find the root of ‘bad’ behaviors and fix the cause, and are fair and consistent when working with them, the horse can relearn that the humans will listen to them and they don’t have to talk as ‘loud’. They will also learn what is expected of them no matter who/what/where the situation. What “naughty” horse behaviors have you encountered? How have you helped that ‘bad’ horse be ‘good’ again? Thank you & Happy Trails ! !